These days we hear all the time about the sky falling in, particularly in Australia, particularly in regards to our water usage. Water usage is a valid concern of the modern home, along with energy consumption and recycling, but there are ways to control it at the source itself. Controlling your water usage by buying efficient products and appliances is one of the best things you can do for your households green rating. By having, say, a shower head that reduces the number of litres per minute, this could mean that your teenager’s endless showers aren’t hurting the environment as much as they once might have. The product will have a certain number of stars assigned to it. The more stars, the more water efficient the product is. 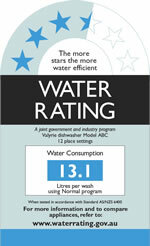 To learn more about this simply visit the Water Rating and Efficiency Labelling scheme’s website. So before you invest in a new washing machine, dishwasher, or shower, ensure you check out how it compares to it’s competitors. You might be surprised how much if benefits you, the environment, and your water bill.